Even if we squashed the beef, I ain't touching ya hand. Such views, unfortunately, are prevalent within the hip hop community. The DMX lyrics quoted above were taken from 2003 album Grand Champ, a record that debuted at number one on the Billboard Hot 200, and the song itself was released as a single. Around 2004 Harlem native Cam'ron popularised the phrase 'No Homo' to justify the use of 'suspect' phrases while asserting that the speaker is a heterosexual. Though these events were nearly ten years ago, the attitudes expressed can still be found in much of the fan base of mainstream hip hop. In 2011, XXL Freshman Lil B received death threats when he announced a new LP titled I'm Gay. The record sold terribly, though that could be down to factors such as the project being available for free for a short while and lukewarm critical response, rather than outright homophobia (Lil B is straight, though has pledged his support for GLAAD). The picture however, could be slowly changing. Popular figures such as Kanye West have publicly spoken out about their previous homophobia, and how they now accept the gay community. N.O.R.E confirmed in 2009 that he is aware he has worked with gay rappers, and he has no real issue with this, while rappers such as Eminem, Juelz Santana, Game and Tyga have either defended the homosexual community, or apologised for homophobic slurs/musical content. A statement like this gives rise to the hope that the new generation of rappers is becoming more tolerant and accepting, something that ideally will be reflected in the new music being produced. 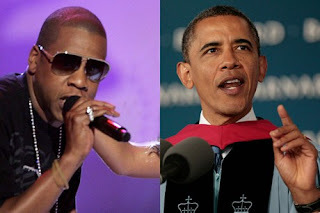 It is elder hip hop statesmen such as Jay Z, however, that have a responsibility to lead the way in changing attitudes. His support of Obama's policy is a strong start.